Our walks are always the third Sunday of the month, in the summer we have occasional mid-week evening strolls and HD XTRA walks. All Sunday walks start at 10.30. Please be prompt, and allow time for putting boots on, last minute trip to the loo etc! Please note that if it is very snowy, we may cancel the walk so please check back here if the weather looks bad. Details of our most recent past walks are here on our Old Walks page. Put them in your diary, and check back for details nearer the time. This classic White Peak walk in the Manifold Valley will be hugely rewarding without too many crowds on Easter Sunday. Just bear in mind that, starting as it does on the popular Manifold Way, parking might be trickier than usual if the weather’s good. It’s a 7ish mile walk that starts in the valley, heads straight up towards Sugarloaf and up to Ecton Hill, Wetton Hill, through Wetton and back onto the flat Manifold Way. A great walk which has a few dog friendly stiles, a few sharpish climbs and descents, may be muddy and where poles are recommended if you have them. 18th August Newbold Coleorton…….party, camp and hyke!! Details of some of our previous hikes here. Starting point for the April walk. Autumn hiking in the woods below Whatstandwell. Nov 2013. Well, we made it! 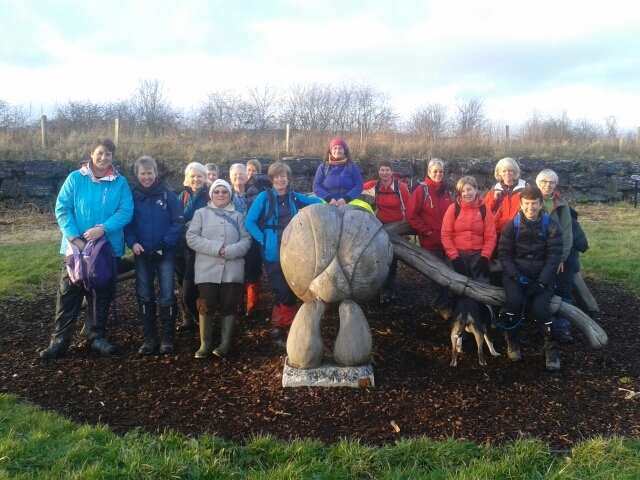 Here's the group at the end of Sandy's December hike. The following Nottingham HD members have offered some additional dates for hikes or other similar outdoor themed walks. We have had successful trips to the Brecon Beacons, Cadair Idris, geocaching in the Peak District, an evening rural pub crawl and a geology-themed walk. MORE OFFERS WELCOME. 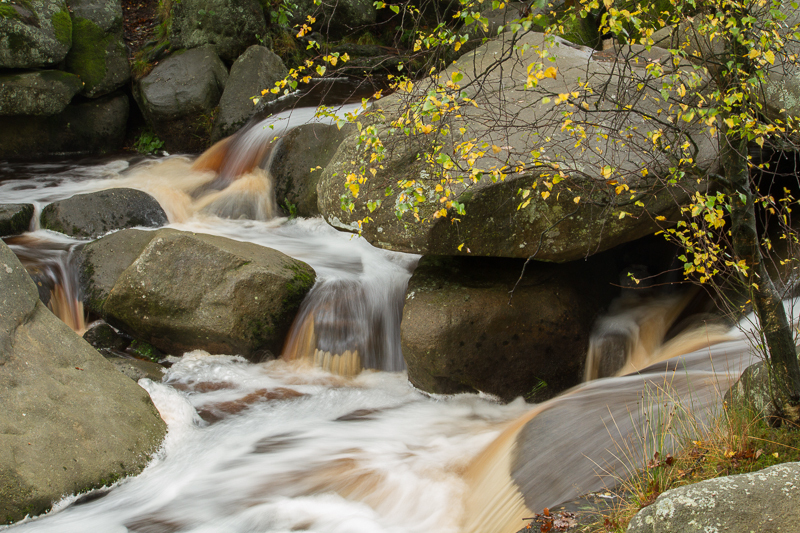 Last November we did a photography workshop at Padley Gorge exploring making the most of your digital cameras with tips on composition and changing apertures and shutter speed. Examples below, due to popular request we will be repeating this in the spring. Keep checking back for details. Flowing water in Padley Gorge. 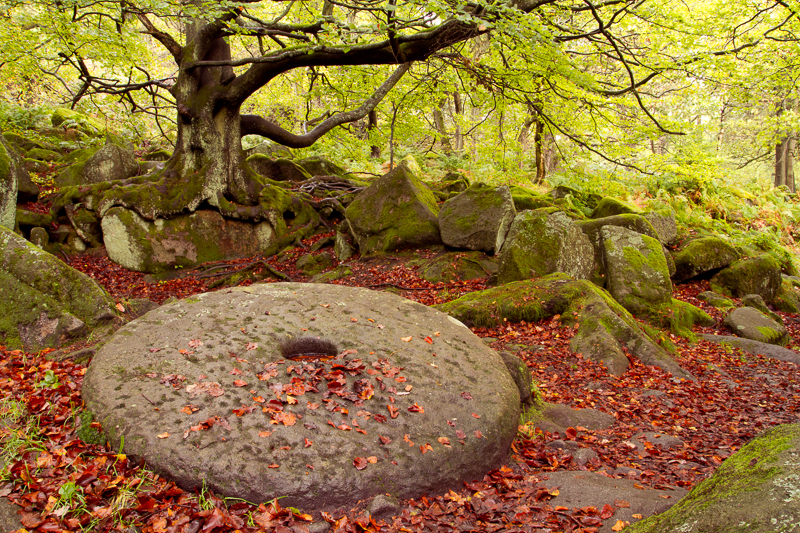 Millstone remains in Padley Gorge. If you join our emailing list you will be sent regular reminders of the walks and further contact details of each walk the week before.